Polaroid 300 Film is just re-branded packs of Fujifilm Instax Mini film. After Kodak was sued and has to stop their Instax camera production. Fujifilm started making with Instant Cameras and film with Polaroids permission. But the catch was they were not supposed to sell Fuji Instax cameras in the American and European market till the 90s. But in 2008 Polaroid stopped making analog instant cameras and Fujifilm became the sole instant camera maker in the market. in 2010 Polaroid started selling Fuji Instax Mini 7s camera as Polaroid 300 camera and Fujifilm Instax Mini film as Polaroid 300 instant film. So you can use 300 instant films in Instax Mini cameras and Fuji Mini film in Polaroid 300 instant photo cameras. Polaroid doesn’t make Polaroid 300 instant film or never made. They were just white labeling and selling this product. If you have a Polaroid 300 camera in working condition and looking for Polaroid 300 film cheap then you try Fuji instant film for your camera too. Just buy the whatever cheaper. Remember Polaroid stopped this 300 camera and film deal while ago too. So whatever remains in the market is old stuff which might be already expired. So It’s recommended to buy Fujifilm product rather than this expired and expensive film from Polaroid. or any other Mini type camera which is not listed here. There is half doze on Fujifilm Mini cameras which are discontinued years ago. Both Amazon and Polaroid website still sell this type of instant film but make sure match prices. Another cool thing about this Instax mini film is you can get it not only with plain white borders but also with various theme based borders. Still, there are thousands of Polaroid 300 camera users and many worry about using Fujifilm Instax Mini film for their camera. There is nothing to worry about. Also, it’s a waste of money buying old Polaroid 300 film which was manufactured more than half a decade ago. New Fuji Instax film is available everywhere and cheaper too. Also, you can’t use the new Polaroid Zink Media photo paper for Type 300 cameras. Zink Media film is very similar to Instax film but there are little differences like the cartridge design. 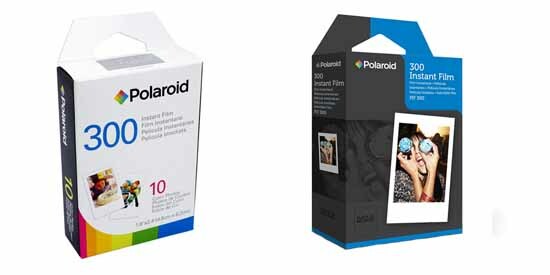 It’s common belief Polaroid Co. has used Fuji’s Instant photo paper technology to build their own new Instant film packs. Maybe the only difference is photo paper is packed in different models of plastic cartridge casings. Fujifilm Instax Mini Twin Pack cost you around $20 with free shipping at Amazon and Polaroid 300 instant film pack cost around $30 at Amazon. 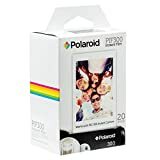 At Polaroid, it cost you nearly the same $14.99 for 10 photo paper pack so 20 papers would cost around $30 but they haven’t mentioned anything about shipping. Means shipping might not be free. You can use Both Polaroid 300 instant film and also Fuji Mini film for Mio cameras. This camera is very similar old Instax Mini 20 camera. Just buy a small 10 photo paper pack of Instax Mini film and test. It won’t cost you more than $15 and will able to clear all your doubts. Best Polaroid Camera to Buy? If it’s time to retire your Polaroid 300 camera and buy a new one then there are several cheap Polaroid camera options in the market for you. Polaroid only makes digital instant cameras now so you will have to look at what Fujifilm has to offer if you still need an analog instant photo camera. If you want a Cheap Polaroid Camera then try > Polaroid Snap, Polaroid Z340, Polaroid Socialmatic camera models. If you just want a Cheap Instant Camera and it doesn’t need to be Polaroid then you should check latest Instax series cameras like Instax Mini 70, Instax Mini 90, Instax Mini 8, Instax 300 (bigger Polaroid 600 size photo paper). Also, there is a cute model for girls, Fujifilm Instax Hello Kitty mini camera. I have used Instax mini film for my old Polaroid 300 instant film camera without a problem. It’s same film. Like article says don’t buy this camera if you want a new instant photo camera. there are better models from Fuji for cheaper prices. Check the Mini8 camera which is great. Polaroids new Zink Film can be used as alternative for Polaroid 300 film ? I still have an Polaroid 300 camera and also a new Polaroid ZIP camera. I have to say new Zink Photo paper is lot better quality wise. Specially if you buy the Zink 2×3 Premium Photo paper. Here in local shops Polaroid 300 film packs are no longer available and I’m little bit worried to use FujiFilm instax mini film for it. No need to worry Fuji Instax mini film works fine with Polaroid 300 camera. If you have a Polaroid 300 camera then just use Mini Film. I’m sure Fuji film is available everywhere. So saw some shops offers very big discount prices for this Polaroid 300 camera. I was thinking about buying 2 for my kids but now I have second thoughts. I think Fuji Instax Hello Kitty camera is a better choice. At least it’s not old as this one and Polaroid is not exactly a reliable company anymore. Buying 300 cameras is not a smart idea. Even there are plenty of film available this camera is early stage cam from Instax series. There are plenty of newer models of Instax cameras out there in market. Can i use zink paper for my polariod 300 camera? You should able to use Fujifuilm Instax Mini film for your Polaroid 300 instant film camera. I’m not sure about Zink paper even thought it’s lot similar to Instax Mini paper. Can’t you find any Fujifilm packs in local camera stories or buy online ? I don’t know why Polaroids keep these Polaroid 300 Film packs soo high price. I mean Instax Mini Film packs are way cheaper and newly made. I hope new Polaroid Originals management will get rid of all these old packs for discount price. People still worried about suing Instax Mini film in these Polaroid 300 cameras because old Polaroid Co. didn’t like that idea and didn’t encourage people when they asked. I still have an old Polaroid 300 camera in working condition and I have long stopped buying these old Polaroid film packs. I use only Fuji Instax Mini film. These are cheaper and works great. Also can be found is most camera stores and almost all online camera stores. I have had this Polaroid 300 camera for nearly 10 years. I have used Polaroid 300 film for years but now it’s getting really hard to find, After reading this article I tried Instax Mini film and it worked perfectly. These Fujifilm Instax Film packs are easy to find in both online stores and in camera shops near by. But I buy from Amazon because I always get better and lower prices than from local camera stores. But now im thinking about getting little bit smaller mini camera. Maybe an Instax Mini 9 or a Fuji Instax Mini 90. This 300 camera is heavy for it’s size and quite bulky. I bought a Polaroid 300 camera from a boot sale. Only costed me 30 usd. It had box and everything plus a film pack which worked fine. I asked my local camera store and they said they don’t received Polaroid 300 film anymore and Fujifilm Instax Mini film should work for the camera. From what I learn here is this Polaroid 300 is the Mini 7s camera. Where can I buy Instax Mini film for cheap ? What is the cheapest you can get these ? Photos looks great even though the film I got must be at least 5 years old. You can use FujiFilm Instax Mini Film packs with your Polaroid 300 camera. Polaroid 300 Film is repacked Instax mini film. So it will work just same. 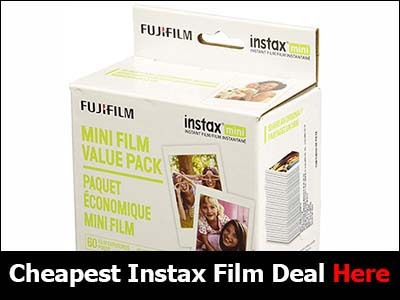 You can a big Instax mini film pack for cheaper. Also if you need something fancy then check those theme packs. These are bit expensive than white border photo paper. But I don’t know if it’s worth that price. It’s an very old model. You could have bought a new Instax Mini 8 camera for 50 usd. These days I have this Polaroid Camera in few locals stores for sale price. Less than 50 USD. I was temped to by but didn’t do it coz I have no idea about these instant camera. I thought to get one for my daughter just to have some fun time taking photos with her. But maybe it’s better buying a newer camera ? It looks nice though. I heard Fuji Instax cameras are better than Polaroid Instant cameras. My sister used of have one of these Polaroid 300 cameras. It was quite good except for the film price. Those days Fujifilm didn’t sell Instax Mini Film in USA or Canada for some reason. So we has to buy more expensive Polaroid 300 film. Plus we has no idea it’s same as Instax Mini Film or this is just same as Instax 7s camera. We thought it’s an original Polaroid camera. I’m glad now Polaroid Co. is in good hands.